Posted February 6, 2019 by Jenna & filed under KidLit Coffee Talk. Welcome to KidLit Coffee Talk! 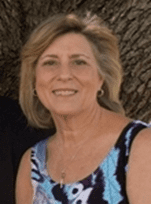 Today, I’m thrilled to feature my friend and fellow author Ellen Leventhal. I first met Ellen in 2016 at a writing retreat. Since then, she has published two fantastic picture books. Don’t Eat the Bluebonnets (Clear Fork Publishing), co-written by Ellen Rothberg and illustrated by Joel Cook, came out in 2017. 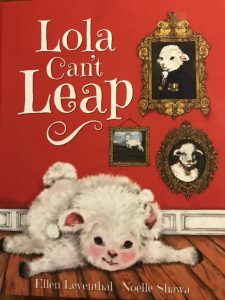 Lola Can’t Leap (Clear Fork Publishing), illustrated by Noelle Shawa, is her latest release. Thank you for joining me, Ellen. First off, what kind of coffee (or tea) do you like to drink? Well if I don’t care about calories or sugar, I love the vanilla flavored coffees, but when I’m being good, I just do boring decaf. It’s probably a good thing because you don’t want to see me on caffeine! Ha ha! Can you tell me a little bit about yourself and your writing journey? I have had a LONG writing journey. I always loved writing, and like many other writers, I’m sure, I am the one who writes all the poems for birthdays, showers, etc. When I was a teenager, I wrote angst filled poetry while sighing deeply. But as I got older, I learned that all writing doesn’t need to be soul crushing. I taught school for a very long time, and I often rewrote the curriculum to make it more interesting. While I was busy tweaking the curriculum, a friend and I also wrote the dialogue for the school musical every year. One day that same friend and I decided that we should try our hand at writing a kids’ book. We entered a contest and won a picture book deal! That was several years ago, and I’ve been writing “professionally” ever since. How wonderful that you got started on this journey with a friend! Tell me about Lola Can’t Leap. I have to admit that I love this little book. My amazing illustrator, Noelle Shawa, brought Lola to life so beautifully. The story is about a lamb who feels like she needs to leap fences like all the other lambs. After all, leaping sheep help babies sleep. But try as she does, she just can’t get over that fence. Happily, Lola finds her own gift and learns that there is more than one way to reach a goal. Noelle did an amazing job with the illustrations. And I love the language you used. What was the most exciting part of the publication process? What was the hardest? Aside from the rush of signing a contract, one of the most exciting parts for me is seeing the illustrations and marveling at how well the words and pictures mesh. The most difficult part for me is marketing the books. I could talk about books and writing in general forever, but I find it difficult to go out and say, “Please buy my book.” So, I REALLY thank you, Jenna, for helping me do this. Of course! And I understand how you feel. It’s so much easier to gush about other people’s books than it is your own. What else are you working on? I’m juggling several projects right now. I am finishing up revisions on a few picture books, I’m in the process of interviewing people for a biography picture book I hope will come to fruition, and I’m doing research for a middle grade historical fiction novel. Wow, it sounds like you are busy! What is your favorite part of being a published author? Reading and talking writing with kids is the best. What’s one picture book you loved when you were little, and a more recent one you love now? This has to be a trick question! ONE?? Ok, I’ll give it a try. When I think of picture books when I was little, Caps for Sale always comes to mind. I remember laughing and acting like the monkeys in the book. You don’t hear about this book much anymore, but I watched a Youtube video of it, and I think it stands the test of time. As far as recent picture books, it depends on the day. I love SO many. The easiest way for me to answer this question is to think about what recently made my grandchildren smile. I read There Was an Old Dragon Who Swallowed a Knight by Penny Klosterman to my grandson the other night, and I still picture him giggling and yelling out “That’s not polite” (a recurring line). That’s definitely one of my favorites, but honestly, there are so many. Great choices! What are you currently reading? I just started Educated by Tara Westover. It is a gripping memoir that I don’t want to put down. It’s about a girl who, kept out of school, eventually leaves her survivalist family and goes on to earn a PhD from Cambridge University. I haven’t read that one yet, but I’ve heard so many positive reviews. Now, let’s have a little fun. What is one thing that most people don’t know about you? Hmm…not so sure that I’m that interesting. One funny thing is that although I consider myself a feminist, I entered and won a beauty contest. The thing is I was three years old. I clearly remember walking across a picnic table and being crowned Ms. Cadwalader School. I got a piece of candy AND a piece of gum for my prize. That was my claim to fame in my nursery school class. Ha, that is a great story! Thank you so much for taking the time to answer my questions. I’m so excited for the release of Lola, and I hope she finds her way into the hands of countless children. To learn more about Ellen, visit her website at http://www.ellenleventhal.com. Ellen has generously offered to give one lucky reader a picture book manuscript critique! To enter the giveaway, simply comment on this post. A winner will be chosen at random on Wednesday, February 13th. And don’t forget to subscribe to my blog. Good luck! Congrats on the book launch, Ellen! This sounds adorable. Caps For Sale! Love it! Fabulous interview! I’ve known Ellen for quite a few years (we met during Angie Karcher’s first RhyPiBoMo (now Rhyme Revolution and we’ve been critiquing together ever since)…but I found out more about her in this wonderful Q&A…thanks so much, Jenna! I don’t need to be entered into the giveaway because Ellen and I critique together anyway…but I will definitely share this post so others find out about it and discover LOLA CAN’T LEAP if they don’t already know about this awesome new book! Thank you for sharing your story! Can’t wait to read the book! Thanks for a lovely interview. I love to hear about author’s paths — I have never heard the same story twice! And Lola Can’t Leap sounds so sweet. I look forward to reading it. I can’t wait to read your book. It sounds adorable! And, I love Caps for Sale!! The book sounds adorable. I can’t wait to read it. Thanks for sharing a little bit about yourself. Thank you for sharing. It was interesting how you became a writer. Yay, Ellen! I love this interview (good job, Jenna) and I adore my copy of Lola Can’t Leap. I will repeat what Vivian said: I don’t need to be entered into the giveaway because Ellen and I critique together, but I will certainly share a link to this interview so others have the chance to win. Lola Can’t Leap looks gorgeous! Sounds like it will be a fun read, can’t wait to check it out! Thanks, everyone, and thank you especially to Jenna for this post! Great interview…Ellen leaps with Lola! Ellen could win a beauty contest now-Miss personality, anyway!!! I, too, loved Caps for Sale! Great interview, Ellen. Go buy her book, people! Thanks for sharing your writing journey and this adorable story. I love your writing journey. Thank you for sharing! I agree with Kaitlyn. This was a fun interview to read. Makes you excited about reading and writing. I can see why the kids are laughing at you school visits. Lola is adorable. I love her name for a lamb. I can see her as a little child’s plush doll. Congrats! I agree with Kaitlyn. This was a fun interview to read. Makes you excited about reading and writing. I see why the kids laugh at the school visits. Lola is a adorable. I could see her as a little plush toy. Congrats on the book! What a great post! Congratulations, Ellen. I wish you much success with Lola, looks adorable. Lola looks adorable and I look forward to reading it, Ellen! I loved reading your writing trajectory. It has mirrored mine in many respects except for the writing contract! Congrats to one of my Clear Fork Publishing family members! Nice to learn more about you! What a wonderful way to learn about your writing journey, Ellen, and to understand more about adorable Lola’s efforts, too. I particularly appreciate how you balance multiple writing projects (different age groups) and how you conduct your delivery during school visits (lots of humor)! That was a lovely interview with Ellen. I really enjoyed getting to know her a little more. I’m hoping one day I get to meet her. Ellen is a wonderful critique person. Congrats on the book coming out! Enjoyed the interview! You guys! I love all your sweet comments, and I especially love sweet Jenna for doing this interview!